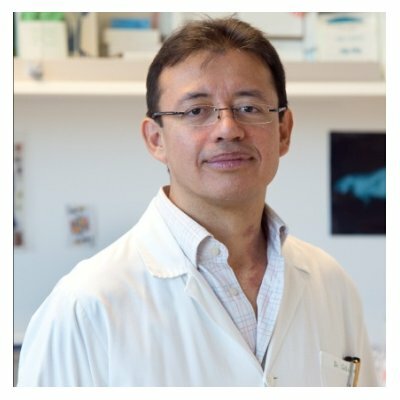 Dr. Jorge E. Collazos-Castro is principal investigator of the Neural Repair and Biomaterials Laboratory at the National Hospital for Paraplegics in Toledo, Spain. He obtained his Medical degree from the National University of Colombia in 1995, and his PhD degree in Neurosciences from the Autonomous University of Madrid and Cajal Institute (CSIC) in 2003. He is interested in contributing to the development of effective treatments for human neurological injuries. His research focuses in developing an electroactive implant comprising biofunctionalized microfibers to promote guided glial migration and axonal regeneration across the lesion site. To accomplish this goal, he coordinates the Neurofibres project, which is funded by the European Commission (2017-2020) and joins the efforts of research centers from the UK, Germany, Italy, Sweden, France and Spain. In order to achieve a reliable evaluation of the effects of neurotherapeutic interventions, his laboratory performs comprehensive studies on the kinetics and kinematics of motor behavior in rodents and pigs, and examines function recovery taking into account the neurobiological changes in brain and spinal cord circuits as assessed by neural tracers, electrophysiology and molecular biology.